28. -, U.S. Standard Atmosphere. Washington: U.S. G.P.O., 1976. 29. 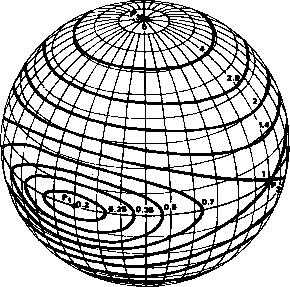 Walker, J. C. G., "Analytical Representation of the Upper Atmosphere Density Based on Jacchia's Static Diffusion Models," J. of Atmospheric Sc., Vol. 22, p. 462, 463, 1965. 30. Weidner, D. K., C. L. Hassetine, and R. E. Smith, Models of Earth's Atmosphere (120 to 1000 km), NASA SP-8021, 1969. 31. Weiss, R., "Sensing Accuracy of a Conical Scan C02 Horizon Sensor," J. Spacecraft, Vol. 9, p. 607-612, 1972. 32. Werking, R. D., R. Berg, K. Brokke, T. Hattox, G. Lerner, D. Stewart, and R. Williams, Radio Astronomy Explorer-B Postlaunch Attitude Operations Analysis, GSFC, NASA X-581-74-227, July 1974. 33. Whitman, Ruth I., Thomas B. McK.ee, and Richard E. Davis, Infrared Horizon Profiles for Winter Conditions From Project Scanner, NASA TN D-4905, Dec. 1968.